Korea128 uses the default Microprose tiles so it looks almost the same as the old Korean theater. The tiling has been made with CATE autotiler software and there is still some work to do to produce the variety for the terrain tiling. Campaign and Tactical Engagement objectives are still to be linked so the airwar and mostly ground war can progress. This theater uses the default Korean textures from original Falcon, no new tiles are made. When using the default tiles we have full set of road, river and airbase tiles etc already ready to use. There are three campaigns in this release using same system as default Korea, easy, medium and hard difficulty levels. The easy and medium difficult campaigns just consist DPRK vs ROK/US in the Korean peninsula but the hard campaign includes China/N/S. 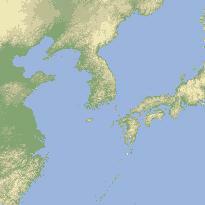 Korea vs US/Japan in big scale war where just the southern tip of Korea is held by the combined forces (ROK/US).